Some New York City neighborhoods are “sitting” neighborhoods, with abundant small parks and benches placed outside of stores. I never worry that I will have to buy something to eat or drink at a café just because my ramblings have tired me out. The West Village, bordered by the Hudson River, 14th Street, Houston Street, and Sixth Avenue, is one such neighborhood of abundant free seating. 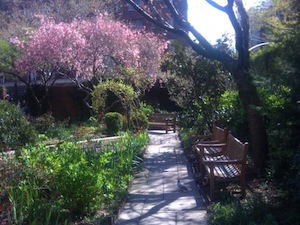 As I wandered along Hudson Street recently, I ran across a block-long garden in full springtime bloom. The profusion of colors intrigued me and I wandered in, only to find out that the property was part of The Church of Saint Luke in the Fields Episcopal Church. There are three separate gardens, with paths, benches (seating! ), and interesting 19th century buildings in excellent condition. One building is currently the parish house and was a boyhood home of author Bret Hart. After this respite, I wandered Hudson Street to the corner of West 11th Street to one of my favorite watering holes, White Horse Tavern, always a good place for an afternoon libation. Built in 1880, and a long-time literary and bohemian haven, the White Horse was the location of the drinking escapades of the two great Dylans, Dylan Thomas and Bob Dylan. The bartenders here are friendly and there is a generally relaxed atmosphere and casual pub menu. Leaving the White Horse, I headed down West 11th Street to where it intersects West 4th Street, just to see the befuddled visitors trying to figure that one out, and overheard one of them mutter “must be a New York thing.” That is the simple charm of this neighborhood, a fantasy land where streets that are parallel can inexplicably transform themselves into geometric impossibilities. The Church of Saint Luke in the Fields is at 487 Hudson Street, between Christopher and Barrow Streets, (212) 924-0562, http://www.stlukeinthefields.org. White Horse Tavern is at 567 Hudson Street, at the corner of West 11th Street. Nice outdoor seating is available.